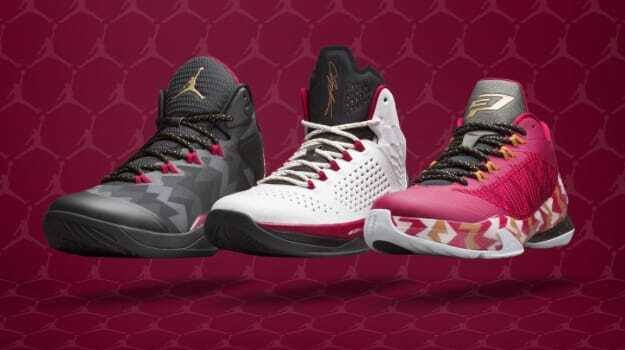 With the Melo M11 event over with, Jordan Brand finally got an opportunity today to officially roll out its Christmas Day 2014 Collection. While we&apos;ve pretty much gotten an in-depth look at all three of the sneakers already, we did learn where the collection&apos;s cardinal red and metallic gold theme came from. On December 25, 1992, Michael Jordan and the Bulls squared off against the New York Knicks in the first meeting of the season between the two rivals. MJ laced up a cardinal red pair of Air Jordan VIIs and proceeded to drop 42 points on the Knicks to go along with eight rebounds, five assist and three steals. The cardinal red Huarache-inpried model is the inspiration behind the Jumpman&apos;s Christmas day collection this year, as the color palette has been applied to the Melo M11, Jordan Super.Fly 3 and CP3.VII. Among the Jordan Brand athletes set to rock the collection on Christmas are Carmelo Anthony, Chris Paul, Blake Griffin, Russell Westbrook, Jimmy Butler, Otto Porter, and Reggie Bullock. Get a peek at the Jordan Brand Christmas2014 Collection in the gallery above and pick up a pair of your favorites when they drop on December 24 at Nike.